A Christmas Carol is a beautiful story, but I find it’s true beauty when it’s explained in the Christian context that inspired it. My son was watching Bubble Guppies and they tried (dismally) to tell the same story inserting “holiday” so as not to offend anyone, I presume. The Christian story is a story of love, of redemption, of second chances and not because one has earned it or deserved it. Scrooge is a dreadful man, yet as the story unfolds, not only does Scrooge’s heart begin to melt as he’s faced with the truth of who he is, but our hearts melt toward Scrooge as we travel through the past, present and future and see what has created such a embittered, cruel person. We empathize and start to have compassion and love the unlovely. By the end of the story, Ebenezer is truly repentant. He’s a changed person determined to share the love and grace that was freely given to him when he didn’t deserve it. Christians believe God sent His only begotten son (God in the form of Man) to pay a debt we cannot hope to pay. God loves us as His children, and our actions have left us hopelessly out off our depth, incapable of paying our debts. Yet Love cancels the debt. Christ’s last words on the cross, “It is finished” literally translate “Paid in FULL.” Jacob turned away from the grace freely offered, so now he wanders, burden by the debts he cannot pay. One of my all-time favorite movies for the holidays is The Muppets Christmas Carol. I believe I’ve seen this movie a few hundred times. I’ve worn out three VHS tapes and at least three DVDs. I play the movie over and over, mainly because, well, duh, MUPPETS! I drive my husband nuts playing this movie over and over…and over. I’m worse than a three-year-old. But, Muppets aside, also I can’t get enough of the music. Also, I love the story of A Christmas Carol no matter how many times I see it, no matter how many renditions, and I am certainly not alone. Charles Dickens’ story of a redeemed miser is a staple for holiday celebrations around the world and across the generations. Very often this verse is misunderstood. “Yeah! BURN ‘EM! THAT’LL TEACH THEM TO MESS WITH ME! COALS! BURN BABY BUUUURN!” Yet, if one looks to the ancient Hebrew, the heaping burning coals is literally the holy fire of LOVE that melts the hardened heart so it can be remade (think of melting a weapon of war to remake it into a tool for healing or farming). Repentance is not the mumbled and counterfeit “Sorry.” Rather, it is finally seeing the truth of who we are and what wrong we’ve done. It’s a decision to make things right and turn away from wrong. By the end of the story, Ebenezer is truly repentant. He’s a changed person determined to share the love and grace that was freely given to him when he didn’t deserve it. Jacob Marley is another symbolic name. Jacob Marley is the name of Scrooge’s old business partner, and it is he who intervenes to try and redeem his old friend before Ebenezer is sentenced to share Marley’s fate. The name “Jacob” actually means “thief and liar.” In the Bible, Jacob stole his brother Esau’s blessing, then manipulated, lied, stole and connived until it came back to bite him multiple times (Jacob later wrestled with an angel until he could be given a new name, Israel and he’d become the father of a great people). What better name to give someone sentenced to roam as a specter for eternity carrying the weight of his ill deeds than a name that literally means thief and liar? Scrooge is the resurrected heart, the dead brought to life. When God promises “everlasting life” it isn’t a promise that we get to float around on a cloud in Heaven after we die. Rather, it’s a promise that life begins at the moment we decide to accept mercy and love. Scrooge has been “alive” but not “living.” He was existing. When he is redeemed, given a new chance, he changes. Out of gratitude for the mercy he is given, he reaches out to give what he’s been given. LOVE, MERCY, GENEROSITY. 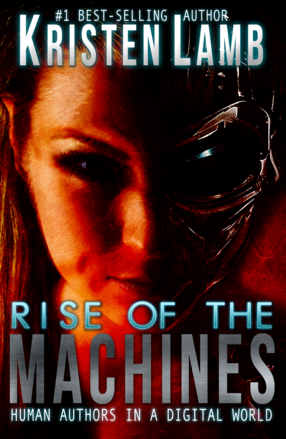 I hope you will check out my newest book Rise of the Machines–Human Authors in a Digital World onAmazon or even Barnes and Noble.